Our Process — Huntington Base Ball Co.
For use on the field, or off. our baseballs are hand sewn in the USA and fully customizable to your needs. Put them to use on your team, in your shop, or on your shelf. "What is your process for re-creating historic baseball styles?" All of our reference material is gathered via first hand observation. If a particular ball was sewn in a certain way, or if it was of a specific size and weight, our goal is to re-create those elements. Other details such as stitch count and thread weight and era-specific typography are also very important. These details are oftentimes impossible to replicate without really great reference material. We’ve been fortunate to have been granted phenomenal access to world class private and institutional collections over the years. When it comes to the early relics, particularly the 19th into the early 20th century styles; the details may be small, but they make all of the difference. Take our Amateur Ball, for instance. That style ball, with its uniquely designed one piece cover, was only used for a very short period of time when organized baseball was in its infancy. The teams were comprised of amateurs, but the equipment was just beginning to be produced by professional craftsmen. Prior to that, most equipment was homemade. Even with a growing market to sell to in the 1860s, the professionally produced baseballs of the era are greatly outnumbered by the homemade equivalents. To find a professionally produced baseball from this era is incredibly rare. Over the years, we’ve been able to study the originals and take very detailed notes of their size and construction. That direct observation and one-to-one comparison allows us to re-create the ball exactly as it would have looked when it was fresh from the supplier in 1860. Those same principles are applied on later examples as well. Our American Ball from Japan’s University League was greatly inspired through in-hand observation of original 1920s era Japanese baseballs. 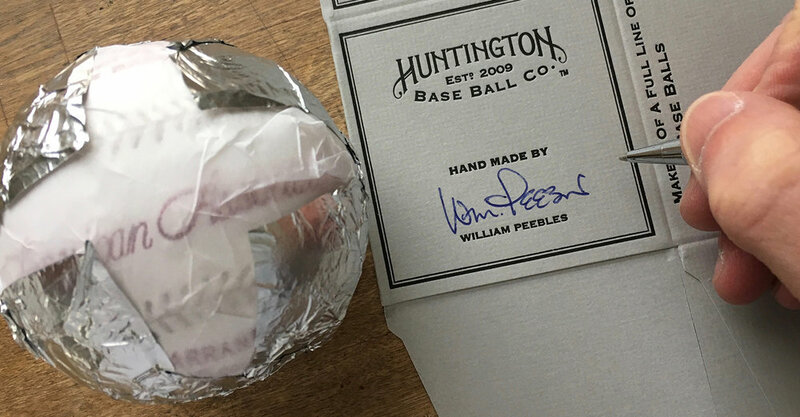 By carefully studying the original details of the thread, the colors, the typographic styles, and the specific phrasing of the stamps, we are able to re-create our version of those baseballs in a very similar fashion to the originals. The details extend to the packaging as well. Without good reference material we never would have known that some early Japanese baseballs were wrapped in a red foil. All of these details add up to a beautiful object that is a faithfully inspired representation of the original. Our emphasis on quality and execution to extends to our custom and made to order baseballs as well. We've handled custom orders from single pieces to quantities into the hundreds. You can choose from a variety of leathers and stitch color options, as well as custom artwork. Hand stamped ink is a popular and cost effective method of getting your mark onto a baseball, but we also offer custom embossing as well as hand color fill and fully hand painted options. The custom details do not end with the product. We also offer custom packaging as well. Contact us. We'd love to discuss your custom product with you. Old world craft, in a modern studio. A nod to the past with our eyes on the present. No matter if it's from our line of historic styles, or a custom ball just for you, everything we make is built around the best materials we can buy. which means everything is made to be used and enjoyed. Go give it a wallop!